Quiche is one of the expected foods at nearly any Easter brunch. The challenge? How to make this egg filled dish without animal products? If you do opt for traditional quiche… please consider cage free, hormone free, organic eggs and meats. Or find a neighbor who raises chickens and gather your own in the hen house (or take a page from Cate and raise your own). If you are coloring eggs this year, consider natural dyes for a fun change. 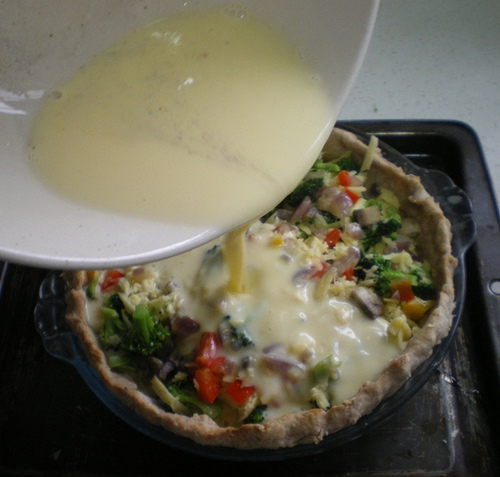 Another idea: if you want a traditional egg quiche, cold dye raw eggs, then blow out the egg and use it in your quiche. This way you get both pretty, dyed eggs and something to eat while using less. 1). preheat oven to 400 degrees F.
4). chop tofu and place in blender, add milk substitute and seasonings. Process until smooth. 9). remove from oven and allow to stand for 20 minutes prior to serving, or chill and serve cold. Enjoy with a tall stack of scrumptious pancakes and real maple syrup. We also enjoy making mini quiche by pressing pastry shell into a mini-muffin or tart pan then filling with the tofu/veggie mixture. Photograph by JimmieHomeSchoolMom on Flickr under Creative Commons License.